Just because the peak of running event season is behind us doesn’t mean there are no winter races to be found in Michigan. Quite the contrary, there are races held throughout our long, grey season, including some eccentric cures for cabin fever that I list below. The End of the World Run, Dec. 22, Durand — What’s the point of entering this one, you ask, what with the world set to end in a fiery flash? Well, defiance, that’s what. As the organizers attest, “Running in the race is proof that the world did not end on December 21st, 2012.” Runners of this cross-country and road 5K race get an End of the World T-shirt, surely a good conversation starter. IDIDARUN, Jan. 12, 2013, Linden — A nighttime race during a new (i.e. no) moon run partly on roads and partly on trails, snow or no snow. This goes for eight miles, but you do it as a two-person relay. Afterward, you get homemade soup, chili and stews to warm you up, all made by parents of Linden Cross Country runners. 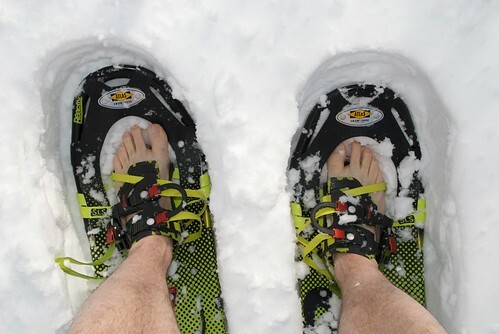 Bigfoot Snowshoe Race, Jan. 19, Traverse City — Like snow? Like running in snow? Then this is the race for you, a 5K or 10K “off trail run” in snowshoes through the Timber Ridge Campground. Don’t have snow shoes? You can rent them. The race will go on, snow or no snow, organizers say, so bring your trail shoes. Winter Wolf 2013, Jan. 19, Omer — Another spooktacular nighttime run, this one takes runners (or two-person relay teams) over 15 miles over semi-developed dirt roads, woods, a creek crossing and the Omer Plains, home of the Witchy Wolf. Another twist: Jan. 19 is a full moon. Head- and taillights required. Arctic Chill Winter Triathlon, Jan. 27, Livonia — Not a fan of running in cold weather? Head to the Livonia Community Recreation Center for this indoor tri, consisting of a 20-minute indoor pool swim, 20-minute ride on an upright spin bike and 20-minute treadmill run. Awards in each age group are based on distance traveled. Cupid’s Undie Run, Feb. 9, Detroit — What could be better than running in your undergarments in February? Putting the “hilarity back in charity,” this 1-mile race sees participants running in their undergarments through downtown Detroit, so there will be plenty of post-race options. A fundraiser for the Children’s Tumor Foundation. Fight For Air Climb, March 3, Detroit — Here’s a unique challenge for the cooped-up soul: dash up 70 flights of stairs in the Renaissance Center, Michigan’s tallest building. Do it alone or as part of a team, and raise money for the American Lung Association. Corktown Race, March 10, Detroit — This race, which will make its 31st running, has gotten hugely popular (and crowded) over the years, for a good reason: It’s a great party and a great way to celebrate the end of winter. The race is a fairly straightforward 5K through this historic Detroit neighborhood, once a haven for immigrants from Ireland. Afterward, stay for the St. Patrick’s Day parade and the several-blocks-long street party that unfolds. What Michigan races are you looking forward to this winter?